Assistant Professor at the Cyprus Institute (CyI), working on atmospheric and climate modelling, responsible for the CyI Visualisation Lab. Previously a Computational Scientist and an Associate Research Scientist at the Cyprus Institute and an International Fellow at the Fermi National Accelerator Laboratory (Fermilab), USA. We modeled the global atmospheric dispersion and deposition of radionuclides released from the Fukushima Dai-ichi nuclear power plant accident. The calculated concentrations have been compared to station observations by the Comprehensive Nuclear-Test-Ban Treaty Organisation (CTBTO). We examined the influence of the North Atlantic Oscillation (NAO) on the atmospheric dispersion of pollution by computing the emission, transport and removal of idealized insoluble gaseous and water-soluble aerosol tracers, tagged by the continent of origin. One of today’s great scientific challenges is to predict how climate will change locally as gas concentrations change over time. The study of chemistry-climate interactions represents an important and, at the same time, difficult task of global Earth system research. The global climate model EMAC is a modular model that simulates climate change and air quality scenarios. EMAC uses a general-purpose chemical kinetic module to calculate the concentrations and the interactions of chemical species in the atmosphere. Understanding the evolution and changes of global climate is of utmost importance in the 21st century. The complexity of simulating the climate is reflected in the structure of the scientific codes in this research field. Scientists from The Cyprus Institute examined an alternative approach to heterogeneous computing in the many-core era for such Earth system models by porting the EMAC Earth System Model application to the DEEP platform. The challenge EMAC is composed of two extremely different code parts. 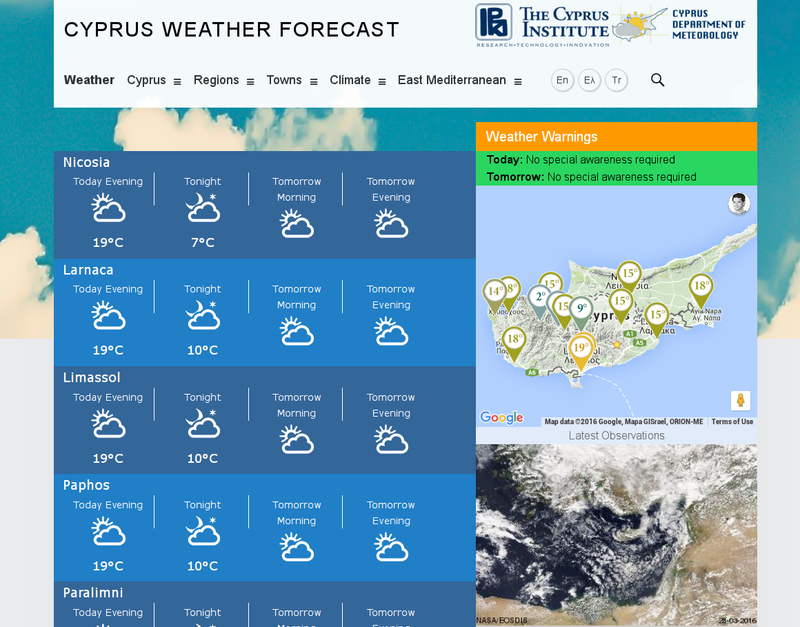 Cyprus Weather Forecast website launched in collaboration with the Cyprus Department of Meteorology. The website was developed and designed at CyI, featuring numerical weather prediction, real-time station observations and human meteorological forecasts by the Cyprus Department of Meterorology. Computational resources and support are provided by the Cy-Tera Project, which is co-funded by the European Regional Development Fund and the Republic of Cyprus through the Research Promotion Foundation. A significant part of The Cyprus Institute’s mission is the promotion and dissemination of scientific knowledge through public lectures, colloquiums and seminars. In this framework the Institute founded in 2010 the Public Talks and Colloquium Series. The lectures are delivered by prominent scientists from local and international Universities and Institutes. All events are presented in English, and are open to the public. Unless otherwise noted, all Colloquia take place at The Cyprus Institute, Athalassa Campus - Guy Ourisson Building, Seminar Room (1st floor) and are scheduled for 45 minutes, followed by 15 minutes for questions by the audience. Cosmological simulations are a cornerstone of our understanding of the Universe during its 13.7 billion year progression from small fluctuations that we see in the cosmic microwave background to today, where we are surrounded by galaxies and clusters of galaxies interconnected by a vast cosmic web. Simulations of the formation of structure in the Universe typically simulate dark matter, a collisionless fluid, as a discretized set of particles that interact only gravitationally. Drought and fire observatory and early warning system: developing an integrated set of services to support prediction and promote prevention of drought and wildland fires. DEEP (Dynamical Exascale Entry Platform) project: development of a novel, next-generation supercomputing architecture. EMAC climate-chemistry model used by CyI as one of the pilot applications. Consortium Responsible repserenting the Cyprus Institute, in the multi-institutional consortium that oversees the development of the ECHAM/MESSy (EMAC) Earth System Model, in association with the Max Planck Institute for Chemistry (MPIC). 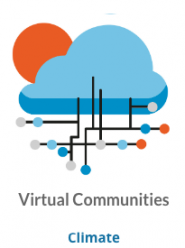 A unified Virtual Research Environment for South Eastern Europe and Eastern Mediterranean. Leader of the Climate Scientific Community. High Performance Visualization for Large-Scale Scientific Data Analytics, NCSA Blue Waters, Spring 2015. School on HPC architectures and large-scale numerical computation, HPC-LEAP, Fall 2015. School on HPC architectures and numerical methods, HPC-LEAP, Winter 2016.
International HPC Summer School on HPC Challenges in Computational Sciences Mentor, June 2016. Workshop on Advanced Scientific Visualization, Cyprus Institute & NCSA AVL, December 2013. © 2016- T. Christoudias, Cyprus Institute · Powered by the Academic theme for Hugo.